What is a good way of knowing what you have on hand? Inventories are most important when a family has a complete food storage program that includes rotation. First, tabulate what the family needs. Often the foods are labeled by date and arranged into categories such as those that supply mainly calories (e.g., fats and sugars), those that supply mainly protein (e.g., meats, eggs, and cheese), and those that supply vitamins and minerals (e.g., fruits and vegetables). Second, when a category has been partially depleted through rotation, it may be replaced with a different food that serves the same general function. This type of flexibility lets a family take advantage of seasonal fluctuations in price and availability. Taking inventory is a good way of inspecting the quality of the food. It also makes the food storage program a living, flexible program that can change with the needs and likes of the family. What is the best method of storing seeds? How long do they last? Garden seeds should be kept dry at all times, preferably in a cool place, and rotated periodically. Buying your seeds a year ahead will ensure a year’s supply of viable seed quite simply. Some seeds may be grown from this year’s plants, but not all﻿—some plants cross-fertilize and produce unacceptable seeds. Hybrids revert to their genetic forebears, which may or may not be good quality. Some seeds that can be safely saved are peas, beans, nonhybrid tomatoes, and cabbage. However, cabbage and its cousins don’t bear seed the first year. Is it wise to include vitamins in your food storage? How long will they keep? If your food storage has limited variety, you should include a multivitamin and mineral supplement. However, no supplement contains all of the thirty-five essential vitamins and minerals. Only a variety of needed foods will do that. Vitamins and vitamin-containing mineral supplements do not store well﻿—they have a shelf-life of about a year. Vitamins should be stored in a cool, dark place. How can we store needed medicines? Any storage plan for prescription medications should be worked out with the pharmacist who supplies the medication. Some medicines require constant refrigeration to retain potency for even a short time. Others may be stored safely for many years. There are no general recommendations. What is the best method of storing water? Must you boil it first? Most families can’t store more than a two-week emergency supply of water, and the best method depends on the family’s needs and storage areas. Some water should be in breakage-resistant containers. It’s not necessary to sterilize pure water from a household tap, as long as the containers are sterile. Impure water, however, must be sterilized before storing. To sterilize water, boil it vigorously for three minutes to destroy bacteria that might be present, or use a bleach solution containing 5.25 percent sodium hypochlorite, the most common type of bleach. If the water is clear, add eight drops of bleach per gallon of water and let it stand for thirty minutes. If the water is cloudy, use sixteen drops of bleach. After thirty minutes, check it. If there is not a distinct taste or smell of chlorine, add another dose of bleach and let the water stand another fifteen minutes. Tincture of iodine will also work. If the water is clear, twelve drops of tincture of iodine per gallon will do. In cloudy water, use twenty-four drops. Water purification tablets, though expensive, may be used by following the directions on the package. Storage containers should be glass or plastic (preferably break-resistant) since metal tends to give the water an unpleasant taste after a while. Glass containers may be packed with newspapers or other packing material to protect them from shattering if they bump. Obtaining pure water during an extended crisis might involve some combination of filtering, boiling, distilling, and/or the use of sterilizing chemicals such as chlorine or iodine. What are the common problems in storing powdered milk, and how do you avoid them? Powdered milk must be rotated, even if you package and store it correctly. Powdered milk will store well at 70 ° F. for twelve months and at 40 ° F. for twenty-four months﻿—but only for three months at 90° F. The short storage time is due to a chemical reaction involving certain amino acids in the milk protein (lysine and arginine) which react with the milk sugar, lactose. This reaction reduces the protein quality. Lowering the storage temperature slows this chemical reaction and preserves the protein quality longer. Powdered milk tends to absorb moisture from the air and become lumpy. If the moisture content of the milk is too high, the flavor and odor will change. Consequently, it should be stored in a moisture-proof container. Powdered milk will store for extended periods of time in a vacuum or in a nitrogen atmosphere, but we don’t know exactly how long it will be good. That depends on the moisture and oxygen in the sealed can. These factors, in turn, depend on the techniques used in sealing the can. Powdered milk may be purchased in both instant and regular forms. Both forms are processed in the same manner, but the instant powdered milk receives an additional step known as agglomeration. According to USDA Handbook No. 456, Nutritive Value of American Foods, there is no nutritional difference between the two products. If both forms are stored in moisture-proof containers, the storage life would be equivalent. What should you do if your wheat is infested with insects? How do you guard against insect infestation? Several options may be considered. The degree of infestation may determine which you choose. Highly infested wheat, which appears to be covered with insect shells, contaminated with fine debris (excreta), and slowly crawling with insects, should be discarded if replacement is available. Such wheat may safely be used for animal or fowl feed. 1. It may be placed in a roasting pan or on a deep cookie sheet at a wheat depth of not more than two inches and placed in the oven at 200° F. for one hour. Killed insects will dry out if left open to the air in a dry climate and may be removed by dropping the wheat in front of a fan or a moderate wind to blow away the debris while catching the grain in a large container. This should be done prior to subsequent storage. 2. If the wheat is stored in an airtight container it may be treated with dry ice. Remove all the wheat, except for one to two inches, from the container. Drop a piece (not pulverized) of dry ice (one-fourth pound per five-gallon container) in the container and pour the wheat on top of it. Place the lid on, but not tightly, for five to six hours; then tighten the lid to be airtight. Leave the wheat for at least one week; then use fan or wind to clean as suggested above. 3. Place the entire container of wheat in a freezer at 0° F. and leave it there for five to six days. Then remove it, allow it to dry, and clean as above. I have heard that wheat should not be stored in chemically treated garbage bags. Is it true that they’re dangerous? At present, there is simply not enough information on the safety of the chemicals used to treat garbage bags to make sound statements as to the safety of the food stored in them. If there is a serious question about possible contamination of food with any chemicals, the food should be discarded rather than risk impaired health. The storing of food should be planned very carefully to prevent waste. What is the best kind of wheat to store and the best method of storing it? Hard wheat is best for making bread, and it should contain 12 to 15 percent protein. Soft wheat contains only 6 to 10 percent protein, but it will make a tender, cakey bread and other food products. Whatever kind you purchase, it should be clean and dry (10 percent moisture or less). The supplier should be willing to verify low moisture, protein content, cleanliness, and absence of living insects. After purchase, the wheat should be placed in a sturdy, moisture-proof container. Since there may already be insect eggs present that will hatch in due time, the stored wheat should be checked periodically for signs of insects. Wheat should be stored in a cool, dry place. How can I dry my own fruit? Good drying fruits are apples, peaches, apricots, pears, plums, prunes, cherries, figs, grapes, and berries (except strawberries). Apples, pears, and peaches are usually peeled, cored, and/or pitted and sliced. Apricots, plums, and prunes are pitted and cut in half, and cherries are just pitted. Berries should be steamed and grapes (use only seedless varieties) blanched before drying. Fruits can be sulfured or dipped in a sodium bisulfate solution (1 1/2 tablespoons sodium bisulfate per gallon of water) to preserve the color. Fruits may be dried in (1) sunlight; (2) the oven, at 150° F.; or (3) a dehydrator. After sun drying, products should be placed one-inch deep in a tray and heated in an oven at 175° F. for fifteen minutes. After drying, fruits should be sealed in containers and stored in a cool, dry area. Detailed information on drying fruits and vegetables can be obtained from local sources, such as universities and government agencies. How do you test the quality of sealed storage foods you would like to purchase? The quality of any food is self-indicating. A small amount should be obtained and prepared as it would be for the family’s use. The quality is then easily measured against the family’s likes or dislikes. If it smells, tastes, or looks bad, you probably won’t want any more of it. But if it passes this evaluation, more may be obtained. It would be very risky for any family to buy a storage packet without personally sampling it. Yes﻿—with conditions. There are some problems that individuals should be aware of in storing dehydrated foods. First of all, be sure to choose a good quality product that you have tried and know to be good. Also, don’t forget that dry foods must have additional water stored with them for use in case water is not available. Some have said that dehydrated foods will keep indefinitely. That is not true. Dehydrated foods, like all foods, have a limited shelf life. In fact, certain chemical reactions proceed at a much more rapid rate when water is removed from a food substance. Dehydrated foods can become rancid and darker in color. Flavor and, in some cases, nutritional quality are affected when these chemical changes occur. To minimize these changes, dehydrated foods should be packaged in an inert gas atmosphere and sealed in an airtight container. A cool, dry place should be selected to store them. Because of their limited shelf life, dehydrated foods should be rotated. Thus, if they are part of your storage plan they must be consumed as part of the regular diet. Regular consumption of dehydrated foods will also help your family become accustomed to them. What are good substitutes for those who live in tropical or semitropical climates? Tropical and semitropical climates offer opportunities not available in the temperate zones. In the tropics, year-round gardens with a wide variety of fruits and vegetables are possible. The cereal grains can be replaced by taro, manioca, or sweet potatoes, all of which can be left unharvested for a considerable length of time and can thus be stored in the ground. Powdered milk can be replaced by fish, poultry, or hogs. Since the high temperatures of a tropical climate shorten the shelf life of stored foods, such commodities should be rotated through a period of several months rather than the year period recommended for a temperate climate. All foods should be stored in the coolest possible location. Dried foods are susceptible to high humidity and must be kept dry. What are the basic food storage items, and how much of each of them is needed to last the average person a year? It’s obvious, of course, that exactly what to store, how much to store, and how to store it all depend on a number of factors: where we live, what customs we have, what kind of climate we live in, personal requirements or tastes, etc. Many variations and combinations of the basic items might be appropriate. One suggested combination of these basic items would be: 300 pounds dry cereal grains, 75 pounds dry milk, 60 pounds sugar or honey, 60 pounds legumes (such as beans and peas), 20 pounds fats, and 5 pounds salt. This would supply approximately 2,150 calories a day for a year﻿—enough for an adult female. Men need 500–700 more calories a day; small children need less; and growing teenagers need approximately as much as an adult man. All individuals and families will want to think very carefully about their particular circumstances and storage needs and plan accordingly. Why is there so much emphasis on home gardening and production? These things are so time-consuming and troublesome. Hasn’t mass production proved to be cheaper and much more efficient? There are several reasons. First, from the time that the early Saints moved West right down to the present, home production has been encouraged in the spirit of our knowing how to be self-reliant. The issue is not purely economics or preparation for emergencies, either; it reaches deeper into life than that. There are a great many satisfactions in self-reliance and provident living. Second, although it may cost more in terms of time, effort, and sometimes even money to produce certain necessities, it is cheaper in the long run because it is the beginning of self-reliance and independence. It will enable us to help ourselves and our neighbors during times of trouble. Third, these activities keep alive the skills necessary for our survival in times of emergency. By and large we are no longer an agrarian society that could turn back to the soil and begin right away to make a living for ourselves. Many, many beginners in home gardening, for example, can testify to that! Learning these skills once again is very reassuring, as well as satisfying. Should students or those who move around a lot or those who live in small apartments try to store food and other supplies? 1. Store food in dual-purpose places, e.g., as the foundation for a mattress, under a table, etc. 3. If possible, share with your own parents or “adopt” another permanent family and contribute to their food storage program, with the understanding that they would share with you during an emergency. What can members of the Church do in countries where food storage is unlawful? Only a few countries still have regulations that prohibit citizens from storing food. Most such regulations that are still on the books are the result of conditions that no longer exist. Many, for example, are carry-overs from the war years, when food was very scarce and hoarding was a real problem. In such instances, members of the Church and other citizens might do whatever is lawful and prudent and appropriate to change these laws. Where this is not possible, there are other alternatives. For example, home production can be emphasized where home storage is not possible. Families can become proficient in producing appropriate nonfood necessities. They can learn the principles of thrift and industry. They can grow gardens. A great deal of food can be kept in reserve right in the ground. Another option is “live storage.” In many circumstances where it is unlawful to store food on shelves it is perfectly legal to store it “on the hoof” in the form of cows, chickens, goats, sheep, pigs, etc., or in a constantly used garden; and thus it is possible to maintain a considerable supply of some basic foods. Also, in many instances where it is against the law to store food in large quantities, it is still legal to have several weeks’ supply on hand. To what extent can our ward and stake organizations be involved in helping members buy storage products at lower prices? “Merchandising activities are not to be conducted by wards, stakes, or quorums, including purchases and sales of any items (such as food, storage containers, fireworks, nonreligious books, etc.) not related to the exempt purposes of the Church. This means that the stakes and wards are not to be involved in the buying and selling of food for storage purposes. Tax problems and competition with local merchants are only two of the difficulties that such involvement can produce. Why do we need a year’s supply? Doesn’t the Church have production projects to take care of its members? The primary purpose of Church production projects is to provide food and nonfood commodities for the bishops storehouses, so that when there is a need a bishop or branch president can draw upon these commodities for the care of the poor and needy and distressed. The production projects also provide work opportunities where parents can work side by side with their children and with other members of the Church from all walks of life. These are great opportunities for consecrating time and talents, for sharing, and for the growth of brotherhood and sisterhood. Among other things, these projects also serve as usable, working land reserves and help members learn and retain the skills necessary to maintain their independence and self-sufficiency in time of need. A large number of the Church’s production projects are agricultural﻿—farms, orchards, dairy and cheese projects, livestock projects, honey projects, poultry farms, and the like. There are also nonfood projects in addition to canneries, bakeries, and other processing enterprises. Members of the Church have the opportunity and obligation to fulfill project assignments as they are given through the wards and branches. In this way, a constant supply of commodities can be assured. They also have the opportunity to consecrate their resources through generous fast offerings and other welfare donations, so that the needs of the poor and needy and distressed in the wards and branches may be met. A year’s supply costs a lot of money﻿—money I don’t have right now. Since it is important that my family does have a year’s supply, should I borrow enough money to get it right now? No. The teaching of the Church is that we don’t go into debt for anything of this nature. We still adhere to that counsel; and although storage is extremely important, it would not do to violate one principle in order to live another. Families can live both principles by planning to gather their basic supplies in an orderly and systematic way as means permit. There are many ways besides borrowing to get started on food storage. What exactly are our responsibilities in the area of home production and storage? 1. Producing food on our own property, and also producing appropriate nonfood necessities of life wherever that is practical. 2. Learning the best methods of preserving that which we produce. 4. Using what we have in an appropriate manner, practicing thrift and avoiding waste. How much would the Church be able to help its members in case of widespread disaster or economic collapse? Would the bishops storehouses be able to take care of everybody? The bishops storehouses have always been geared to care only for the “poor and needy and distressed” among us at normal, everyday levels of need. Therefore, the storehouse system carries only a year’s supply of commodities to meet the present level of member needs. It is not possible to maintain a backup supply to cover the needs of all the families of the Church. In cases of localized emergency﻿—Idaho’s Teton Dam disaster, for example﻿—the Church Production-Distribution Division is able to call upon Church resources, including the bishops storehouses, to send aid to those in need. But if a major, widespread disaster were to occur, the storehouse supplies would be depleted very quickly. This is one of the reasons why the family’s year’s supply is so important. During good times our welfare projects can meet ordinary commodity needs and pay their own operating costs. But if times were to become more demanding, the members of the Church would be obliged to live from their food supplies while they and Church leaders worked to produce adequate crops and other supplies. 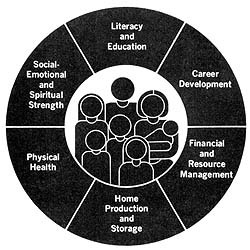 How does home production and storage fit into the Church’s personal and family preparedness program? 1. Literacy and Education. The prepared person reads, writes, and does basic mathematics; regularly studies the scriptures and other good books; and uses local resources to teach these skills and habits to all family members. Parents and children should take advantage of public and other educational opportunities. 2. Career Development. Each head of a household should select a suitable vocation or profession and pursue appropriate training. Each young person should receive counsel to help him select a career that will satisfy family economic needs and provide personal satisfaction. 3. Financial and Resource Management. The prepared person should establish financial goals, pay tithes and offerings, avoid debt, wisely use and preserve economic resources, and save during times of production for times of nonproduction. 4. Home Production and Storage. Each person or family should produce as much as possible through gardening, and as much as appropriate through sewing and making household items. Each person and family should learn techniques of home canning, freezing, and drying foods, and where legally permitted should store and save a one-year supply of food, clothing, and, if possible, fuel. 5. Physical Health. Every member should obey the Word of Wisdom and practice sound principles of nutrition, physical fitness, weight control, immunization, environmental quality and sanitation, mother and child health, accident prevention, dental health, and medical care. In addition, each member should acquire appropriate health-related skills in first aid and safety, home nursing, and food selection and preparation. 6. Social-Emotional and Spiritual Strength. Each person should build spiritual strength to meet life’s challenges and stresses with confidence and stability by learning to love God and communicate with him in personal prayer, by learning to love and serve his neighbor, and by learning to love and respect himself through righteous living and self-mastery. Each family should understand that social and emotional strength is a blessing that results from spiritual growth through obedience to revealed principles of family living. If fathers and mothers will actively plan and prepare their families in all these areas, great strength in the proper balance can result﻿—for the Church as well as the family. Families will not only be prepared for emergencies, but their ability to husband resources, to exercise wise stewardship, to prevent problems, and to make the best of everyday living will also be enhanced. Personal and family preparedness is the key to self-reliance and family integrity in the Church’s total welfare program. In some countries, food must be stored “on the hoof”; and in every nation, the Saints should store the foods appropriate for the local climate. Home storage: Ask yourselves “what if this happened”﻿—and then be ready for it. Growing your own food is not necessarily cheaper﻿—but it’s more dependable. The Church Welfare system can only store enough for the poor and needy at normal levels of demand.